Tree subsidence damage occurs as roots extract moisture from clay soils. Shrinkable clay soils reduce in volume when sufficient moisture is extracted. 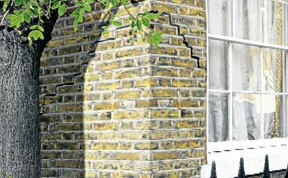 If this occurs to soils beneath a building then the foundations may sink and subside, causing tree subsidence damage. Whether or not this is likely to happen will depend on many complex inter-related factors including species of tree, size and vigour of tree, proximity of tree to the building/structure, type of soil beneath foundations and the depth, type and quality of foundations. Further arboricultural information relating to tree subsidence damage can be found by following the links below. If you would like to discuss your tree subsidence issue, you may contact us free on 0800 030 4045 or you can email us via our CONTACT US page and we will promptly deal with your enquiry.